Kothamalli/ Coriander leaves are good source of antioxidants which delays ageing as well as helps in regulating insulin levels. Kothamalli is one such herb which has good taste as well as nice aroma. It is added in almost all Indian dishes to enhance the flavour. When we use our fresh home grown veggies or greens in our cooking it preserves nutrients and gives great taste. I still remember my childhood days when I used to sow the coriander seeds in mud pot and wait for these fresh green herb to pop up. I will be jumping out of joy to see when my greens start raising from the seeds . 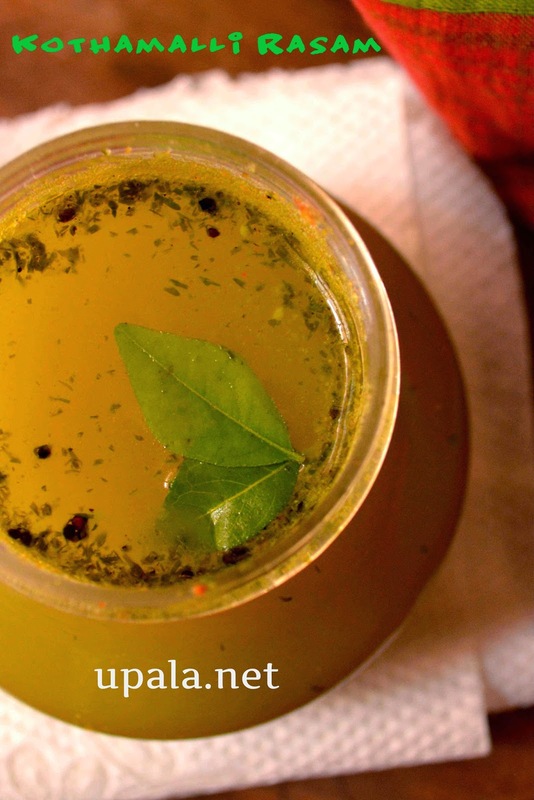 This is one of my favourite rasam which has nice green colour and tastes so yummy....not only that lots of anioxidants too. 1) Pressure cook toor dal and keep aside. 2) Make tamarind paste and dilute it. 3) Add tomato to tamarind paste and let it boil for 5 mins. 4) Add Rasam Powder, Aasafoetida and Salt and let it boil for another 5 mins. 5) Add mashed toor dal to Rasam and dilute it with enough water. 6) Grind all the ingredients given in "To grind" and add to Rasam. 7) When the froth comes add chopped curry leaves and switch off the flame. 8) Heat ghee in a kadai and add mustard seeds to crackle. Season the Rasam with this mixture. 1) If you want this Rasam to be spicy add a red chilli while seasoning. 2) You can also add a pod of garlic while grinding and add to Rasam, this will give a slight variation and garlic tinge to Rasam.